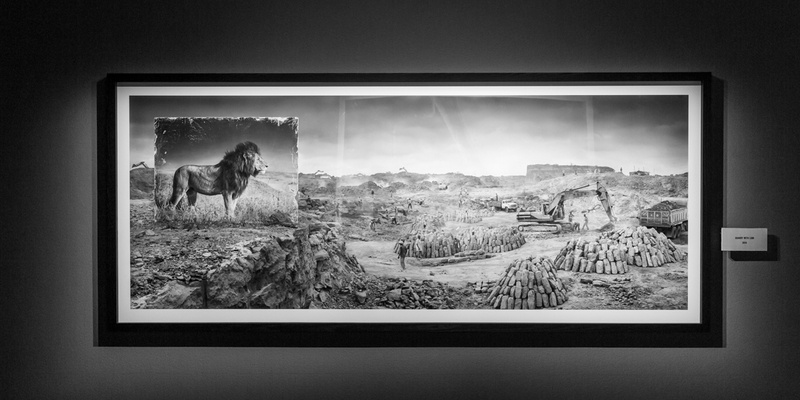 Brandt has developed life-size prints of his fantastic animal portraits, glued them to huge aluminium and plywood panels, and carefully placed these in polluted, abused and dystopian parts of Africa, where animals once roamed freely and lived in harmony. 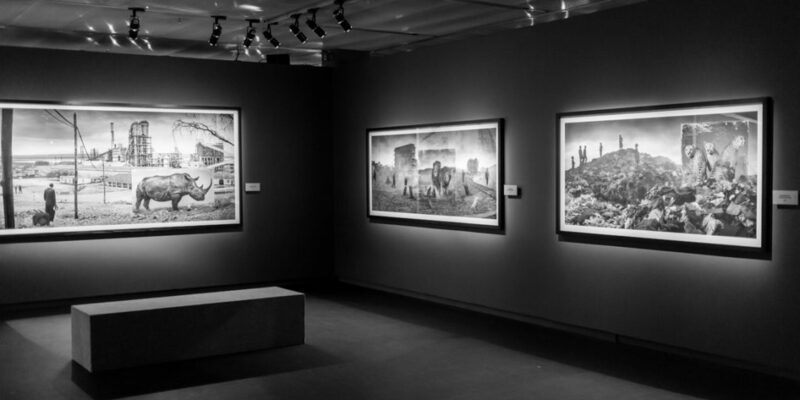 The panels were left long enough for the inhabitants to stop paying attention to them, after which Brandt captured the scenes as black-and-white panoramas through the lens of his medium-format Mamiya RZ67 Pro ll. Brandt’s “ghost animals” are a stark reminder of what poaching, climate change and capitalism actually put at stake here. Together with the marginalised, poor people living in these places, they are the victims of our destruction of nature. I buy a copy of Brandt’s book, make a donation to the Big Life Foundation and leave the exhibition feeling embarrassed and hopeless. 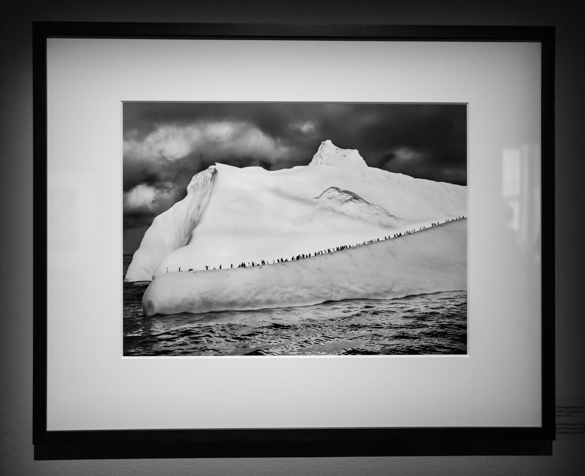 I wish that parents bring their kids to Fotografiska. They need to see this now, and I bet you: they don’t want to inherit the dust. 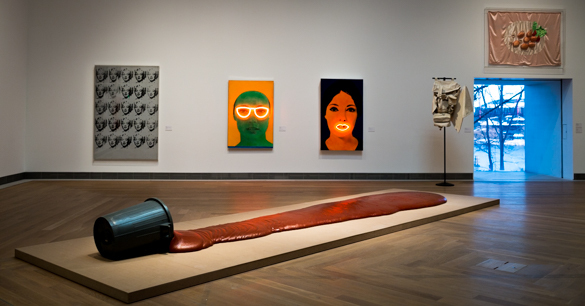 “Directed Pink Expansion,” César Baldaccini, 1967, Plastic bin and polyurethane. I’m back in Stockholm. I decide to take a peek at Moderna Museet. As always, it’s hosting a nice mix of works by pop artists. On the floor of one room is “Directed Pink Expansion.” I do not gasp at its beauty; but the work is arresting in many senses. The entire spilled thing looks messy and sticky; it disturbs and amuses me. I like to have things in order; nice and neat and tidy. Call the cleaners ASAP! But I don’t move on. I become aware of association of thought and emotion unusual in the cool confines of a prestigious gallery. Even though I know the structure is made of hard polyurethane (for that is what the little sign says,) I want to poke this goo. An inner voice tells me that it is chewy, edible and maybe poisonous (or maybe all three!) The colour suggests caramel, tomato sauce or blood. Or maybe this is a bin of some awful all-invading toxic waste accidentally knocked over and now polluting the environment? How would the Ghostbusters deal with it? César Baldaccini (1921-1998) remains a key figure in French contemporary sculpture. This is the guy who, in the early 1960s after visitng a car-crusher, famously exhibited cubes made of compressed cars at the Paris Exhibition. At the same time, he did a number of “expansions.” Wow! Fascinating links! Compression and expansion; pushing together and falling apart; filling and spilling; construction and destruction. Was César buzzing around the basic laws of physics about energy states and everything tending toward chaos? And why do I think of cleaners? Because what they do, in terms of physics, is expend energy to turn a tiny little bit of our chaos-destined universe back into order. I look again at Directed Pink Expansion. If universal laws of physics were in César’s head in 1967, there is something not quite right about the way the work is displayed here. It is on its own thin stage! Only when I look on-line for other images of this work do I see how it is so much more powerful when displayed in direct contact with the floor. 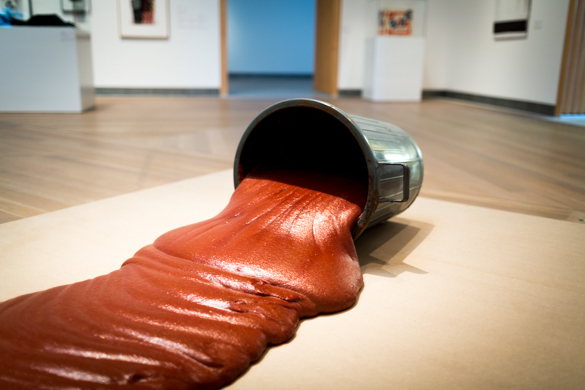 This allows the idea of a real spill, directed or not. If you come across it unexpectedly, you might just call the cleaners and then I bet good old César’s ghost would bust out a smile. I am in Sweden for a week. 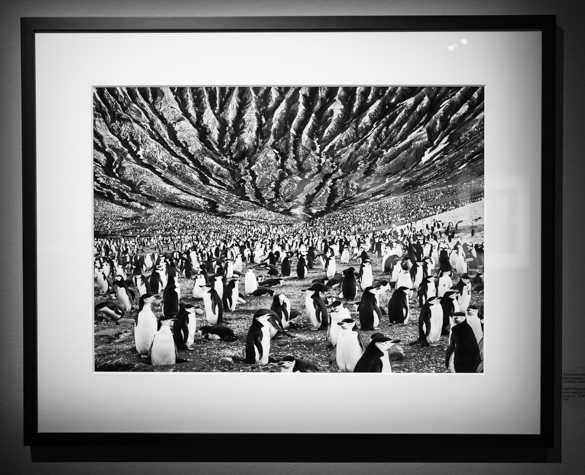 I go to see an exhibition by the Brazilian photographer Sebastião Salgado. Question: do I really want to see more images of penguins in cold sea and ice landscapes? Answer: Yes! 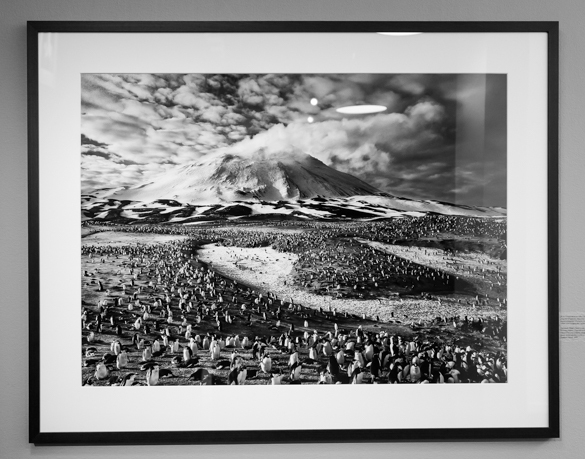 If they are photographs taken by Sebastião Salgado. I stroll into the Swedish Museum of Photography. My jaw drops. I am simply stunned by the images. This is a masterclass in composition, story telling and developing. “Award-winning” is an inadequate description. Saunders Island is inhabited by penguins of several different species, notably the chinstrap (Pygoscelis antarctica), which number over 150,000 couples. South Sandwich Islands. 2009. I take photos of the photos. My camera feels cold. My fingers feel cold. I shiver. How is it possible that these beautiful images take me to the most inhospitable part of the world, focus on a cute fluffy swimming flightless bird and yet somehow what arrives in my mind’s eye is the environmental cost of human over-population? Zavodovski Island is home to some 750,000 couples of chinstrap penguins (Pygoscelis antarctica) as well as a large colony of macaroni penguins (Eudyptes chrysolophus). The island’s active volcano is visible in the background. South Sandwich Islands. 2009. A colony of chinstrap penguins (Pygoscelis antarctica) at Bailey Head on Deception Island. Antarctic Peninsula. 2005. Back home, I take a look at Sebastião’s website. I have an insight to the work of a truly great photographer but also a photographer whose mission involves putting his work to work. 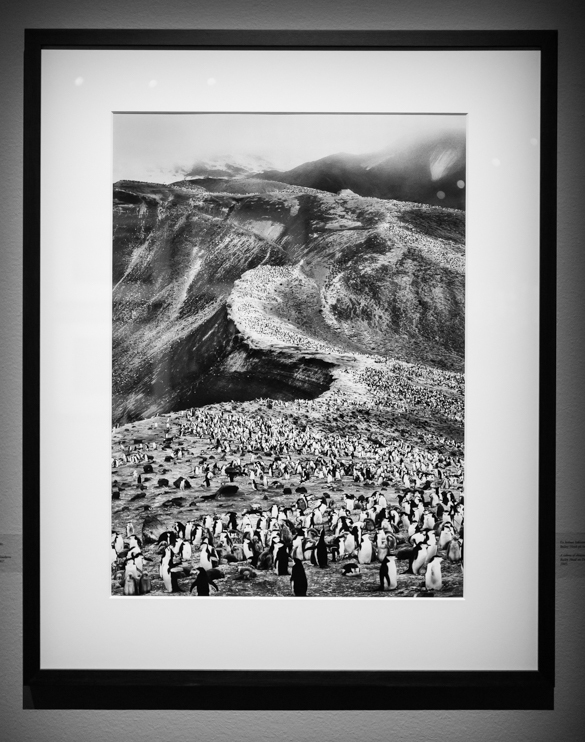 These extraordinary penguin images are part of “Genesis” started in 2004; it is a bigger project about a pristine natural world and invites consideration of human’s interaction with it. Chinstrap penguins (Pygoscelis antarctica) on an iceberg located between Zavodovski and Visokoi islands. South Sandwich Islands. 2009. Sebastião’s concerns – and his projects – go further than the environment, his images tell of the dispossessed and injustices in all corners of the globe. They punch. Hence his photo essays carry titles such as “Coffee,” “Migration,” “Polio,” and “Workers.” He also runs a “Smiling Children Project” via his Facebook page. Too sugary? Maybe. But with this morning’s news screaming the awfulness of Iraq, Gaza, Ukraine and Syria, I’m happy to be reminded of a common attribute that binds us social animals together rather than the all too common brutality that pulls us apart. Question: Can images alone bring about change in the world? Answer: Yes! If they are photographs taken by Sebastião Salgado.